2) Groom's outfit: Light blue shirt with white collar, cuffs and vest, black pants and shoes. 3) Bride: Tea-dress, hair with big curls at the hair ends, with a tiara positioned slightly slanted to one side of her head, and with a veil. 4) A few accessories (e.g. necklace and earrings) on the bride will be nice. 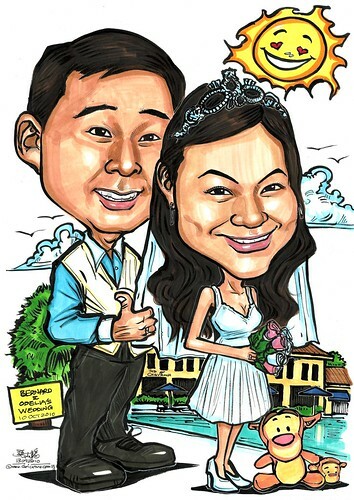 10) Anywhere - The words "Bernard and Odelia's Wedding" and date "10 OCT 2010""
Jit, thank you so much for doing a great job for the drawing. All my guests like the picture very much and find it very cute! hope to have the chance to work with you again. Once again thank you for all the patience to us as we made quite a lot of changes even near to date of completion.